Safeguards against overloading of cranes - load limiters. Small private company was founded in 1990 on the basis of its own invention crane overload fuse. During several following years the fuse went through development, at the present we produce the third improved type of this fuse. 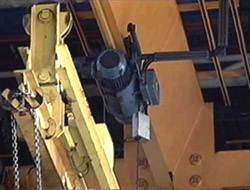 The staple product of the company is crane overload fuse. This fuse has an original simple construction, which is noted for its reliability. Stretching force is adjusted after fuse fitting on the rope at the range from zero to rated value. The fuse is placed close to fixed rope end anchorage or close to equalizing pulley. Fuse can be provided with a metal sheet covering or coverless. It can also be produced in a double version (i.e. to signall undesirable rope unloading). Close look at the complete fuse. 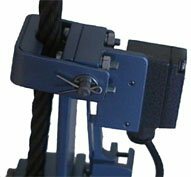 According individual customer request we also produce gange to measure tractive force at light rope. When measuring the gange is placed aside the rope - it is not mounted in the series with rope. Note. : fuse Fmax 5 is without covering, up to rope diameter 6,3 mm. Actual price-list we sending after call.